Well, we’re back home, though neither of us is particularly happy about that given the weather to which we’ve returned. It seems that England had some good weather while we were away but it collapsed to give us our normal wet welcome home. Since then, Suffolk has witnessed a funnel cloud and been covered with so much hail that it looked like snow, and some of our high ground actually has had snow – in June for Christ’s sake! It’s so damn cold. What the hell is going on? It doesn’t seem to be just us, either; our return flight flew for more than two hours over solid cloud covering much of Italy and all we could see of France. We made the right choice. We succeeded in our ambition. The Corfu Trail is a snaking 220 kms/140 mls path winding its way from the southernmost point on Corfu to the northernmost point covering very varied terrain, crisscrossing the island as it goes (see previous posting for a map). When I say “we succeeded”, what we did was slightly different in that our Explore! group acted as guinea pigs and went from south to north on a modified route. We merged two original days into one, shortcutting a big loop that doubles back on itself at the northeast of the island. That gave us one very long last walking day of about 25 kms/16 mls. I estimate that our route would have been about 190 kms/120 mls covered in 10 days of walking. In retrospect, I’d have preferred to stick to the original route, just to have completed the official Corfu Trail, but it’s a relatively minor point, for me at least. We flew out to Corfu a day early which gave us time to explore Corfu Town. It’s expensive and not just because of our currently disastrous Euro/Pound exchange rate: €3.50/£3.20 for a small beer. Corfu Town boasts Greece’s only cricket pitch, courtesy of being a British protectorate for a while in the 1800’s, where, I imagine, games are rarely rained off unlike Lords and the Oval, etc. 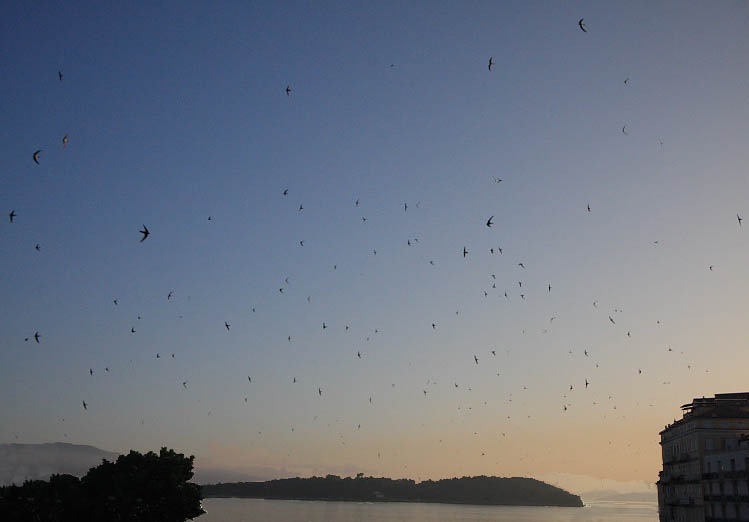 At this time of year the skies above Corfu Town are absolutely full of whirling, screaming and chattering swifts. The screamers are regular swifts and the chatterers are larger alpine swifts which were new to us and quite a thrill being wildlife nuts. The whole island is filled with magnificent Cleopatra butterflies. I’ve seen them before in southern France but never in such concentrations as in Corfu. Not a day went by without having Cleopatras flutter across or along our path. Neither have I ever seen such concentrations of spent 12-bore cartridge cases. The French have a reputation for blasting away at anything that moves but on this evidence I reckon the Corfiots have got them licked. Masses of colourful wild flowers, a few of which our assembled horticulturalists didn’t recognize, lined most of our route. Well, there has to be something to attract those butterflies. Then, of course, there were the olive groves. The olive trees on Corfu are like no others I’ve ever seen in that they are not pollarded or pruned. Apparently, Saint Spyridon declared that it was cruel to prune the trees so they are left to grow to their natural large size. The olives are harvested by covering the ground beneath the trees with netting and waiting for the olives to drop to be collected. We were frequently walking on net-covered tracks through olive groves trying not to crush the harvest. 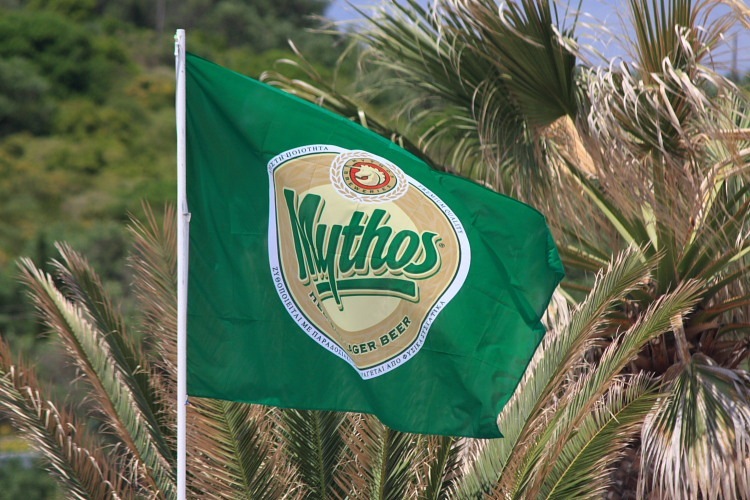 Thirsts en route were admirably slaked by the local Greek Mythos beer. 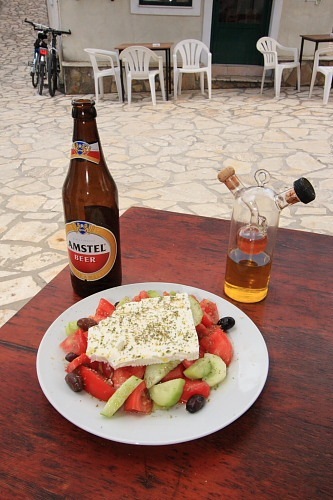 Fuel generally came in the form of very good Corfiot food in various restaurants and tavernas along the way. (Do not be tempted to eat at all-inclusive hotels – that’s a different story). The grilled octopus and squid, though, were notably exceptional and everything was washed down with obscene quantities of crown-cap retsina. Excellent! The weather in the first week was hot and humid. Walking up hills in 35°C/88°F was a little uncomfortable but we got used to it. The humidity made life hazy for vista photography but we snapped away regardless; we were wasting only pixels, after all. We had some cloud cover for some of the second week and, on one morning, rain. Gasp! Greece, June, rain? Doesn’t compute! Naturally, this was when we were walking up to the top of Mount Pantokrator, Corfu’s highest point at 913 metres/3000 feet. The peak was in the cloud so the views were obliterated. At least we’d taken the waterproofs for a reason. Just read re your trip in the Corfu Trail. I am planning same but may go solo as I cannot find Group to join on my dates. I have all details and the Guide/Maps. My question is how easy was it to stay on the trail; spot the markings etc or did the Leader know way by experience. I don’t intend to cut last two days even though after 3 hours uphill on last day you are just few hundred yards from previous day as I want to take in full trail and also you would miss some of the ancient villages (some deserted) in doing so. Also how did you find the timings compared to those shown on the Guide. Finally how tough was the walking underfoot. Thanks in advance and glad to see you thought it a terrific trip. As a regular to Corfu I just want to see whole island and what better way than a long stroll! !